Articles + Blog DO YOU EVER SAY, “THAT’S JUST WHO I AM.”? DO YOU EVER SAY, “THAT’S JUST WHO I AM.”? I. Do You Ever Say “That’s Just Who I Am.”? I recently attended a small, multi-day conference that provided us—speakers, participants, and organizers— the opportunity to form a community beyond just the scheduled sessions. Our conversations over meals and breaks ranged across diverse topics, from applying our conference learning to work to travel adventures, raising kids, and sharing recipes. Human conversations, you know? My family often mocks me for knowing (sometimes absurdly) obscure or unrelated facts (“How did you know that?!”). But until this new acquaintance shared her assessment so directly, I can honestly say that I’d never thought much about it. “That’s just who I am,” is what I say, or “That’s how my brain works,” and I laugh it off. But the gift of synchronicity is such that her comment landed on top of my recent learning on Contextual Intelligence (CI) – defined as: “proficiency at adapting knowledge and skills to different situations and environments,” or “the skill of looking at the world through new/different lenses when selecting the best action.” (You’ll be hearing more from me on CI and Leadership in the future). One of the core questions of CI is, “what’s another way to look at <this>?” That question, applied to the feedback I’d received, challenged me to question my own story. What if it’s not “That’s the way I am,” but rather, “Who I have practiced becoming?” What if it’s not inherent in me but is an outcome of my habits and behaviors? Yet SBS also feeds my soul, my curiosity and, in the end, my Way of Being. I am an Ideator. I read broadly and prolifically, and while following wildly divergent paths distracts me and slows me down, ultimately SBS feeds my main drive: coaching and teaching others, serving as a catalyst and connector, feeding ideas to my clients, showing up with whatever they need, because my toolkit is broad and deep and constantly evolving. I drink in my experiences, readings, learnings, and conversations, and they become part of me, available to my work in the world. 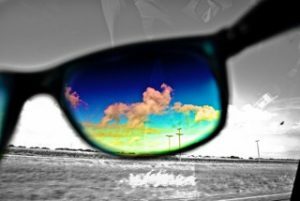 I can view my reality through a Negative lens (I’m flawed, a procrastinator, unable to focus, the attention span of a squirrel…) or through an equally valid Positive lens (I’m a voracious learner, diverse interests, deeply curious, Ideator). Most importantly, I can leverage that new awareness to choose different actions in the future, based on the context, based on what’s needed. So what’s this got to do with you? Plenty! You get feedback every day that you’ve probably been ignoring because the “that’s the way I am” voice in your head blinds you to other possibilities. Reflect on that behavior and ask, “What are some other, equally valid, ways to look at <this>?” Consider an opposite point of view, or look at it from a different context (e.g. work role vs. role as a parent, child, sibling, colleague). Examine the behaviors in which you engage that build strength in that habit — in other words, what do you repeatedly do that feeds into the way you think, feel, and act. Notice what emerges from your reflection. What CHOICES are you now aware of that were not visible to you before? And where might you experiment to expand your capacity for dealing with future challenges? Remember: Leadership is not about a title. Anyone can be a Leader who engages in self-reflection and awareness, especially to build flexibility in an increasingly crazy busy world! (Follow this link to see the Grow Your Business Video I shared last month, including the “backstage” segment. First up: a three-minute piece on How to Change a Habit. At 3:15 is a back story on how I live what I teach. At 4:50 you’ll learn about my Dark Side, and at 6:25 is a short segment on How to Build a Confident Body. Enjoy! The Skimm’s quirky news summary is one of my daily MUST READs. It’s a quick, easy, and entertaining way to know what’s going on in the world.